One of my special places in Venice is the small campo behind the Scuola di San Rocco. Small, hidden, it is private and usually deserted. I've spent many hours there enjoying the quiet, the warm salmon coloured walls of the Scuola (which was built by Pietro Bon between 1515-1524) and the sound of the water lapping against the water steps from the the Rio della Frescada. 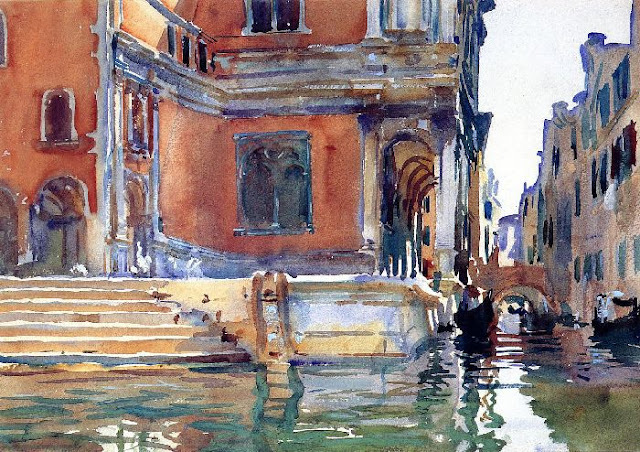 Some years ago, I was leafing through a 2006 exhibition catalogue, Sargent's Venice, and my heart stopped - there was my campo, captured by one of my favourite painters of Venice, John Singer Sargent (1856 -1925). Sargent apparently painted several watercolour views of the campo, but this version above is my favourite. It captures the serenity and gentle beauty of the scene. If I so chose, I could purchase reproductions of this image on a variety of items - kitchen tiles, IPAD cases, drink coasters, even a jigsaw puzzle..but I'd rather let the memory of ths wonderful image dwell in my imagination. Thanks for reminding me of that marvelous campo, which I haven't visited for too long--which I basically forgot all about. I had no idea Sargent painted it, and would never have known it, I suspect, if not for your post. What a great water color. I'm in complete agreement with your willingness to hold this image only in your mind and memory, not in your hands on the side of a coffee cup. It seems rare to resist purchasing a souvenir these days--I find it takes an effort--but I think it's worth it. Certainly, two of my favorite writers (Henry James & Proust) repeatedly emphasized that such restraint, such a trust in personal memory, was the better path.